YummyInTheCity: Jamba Juice - Buy one smoothie get one free! 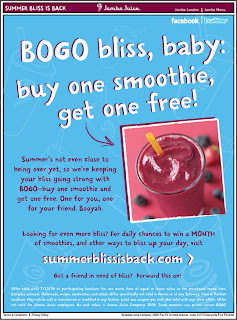 Jamba Juice - Buy one smoothie get one free! From now until July 12, Jamba Juice is having a Buy one smoothie, get one free deal at participating locations. One of the smoothies must be a Blackberry Bliss. Unfortunately I don't know what "participating locations" exactly means - but if it's like the pinkberry deal last week - it probably means everywhere? Well, maybe not Time Square...I always feel like NY is almost left out of all the McDonald's promotions - but who knows - maybe not this time! Anyhow - worth a try if there is a Jamba near you! Check at the Jamba Juice SummerBlissIsBack site for more fun deals. Great way to cool off this July 4th weekend!